We have Just Sold out of Star Trek U.S.S. Enterprise-E Dedication Plaque #2. Not to Worry! 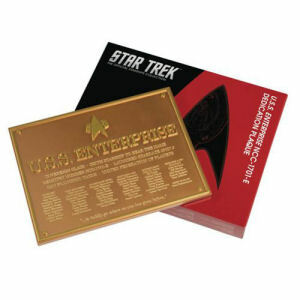 Fill in the Notify me When Available and you will be the first in line for our restock of Star Trek U.S.S. Enterprise-E Dedication Plaque #2 !! From the Star Trek Starships collection by Eaglemoss Publications. Star Trek U.S.S. Enterprise-E Dedication Plaque #2. The plaque measures 10 inches across and has hooks on the back so it can be hung on the wall. Ages 15 and up.